OkCupid Acquired by Match.com for $50 Million. OkCupid co-founder and CEO Sam Yagan will stay on at the site to run operations. “Our goal is that [the acquisition] will have no effect whatsoever,” Yagan told us, saying that no positions will change within the company, and that it will continue full-steam ahead as usual — sans censorship or fees. Sounds great but is this all lip service? To be honest, as some people have already noticed. A article about paid vs free online dating has been taken it down! Internet denizens have also pointed out that a popular OKCupid article from last year titled “Why You Should Never Pay For Online Dating” has been taken down from the company’s blog. “I chose to take that down. Match didn’t ask,” Yagan says, denying that the other site was attempting to censor OkCupid. Apparently, the story was pieced together from public information, and Yagan has learned that some of the assumptions made in it were untrue. Today I’d like to show why the practice of paying for dates on sites like Match.com and eHarmony is fundamentally broken, and broken in ways that most people don’t realize. Oi! No wonder it was removed, its a scaving deconstruction of the match.com business model, oh whoops I mean our new boss. And if that wasn’t so bad enough, this bit will have you in stitches. 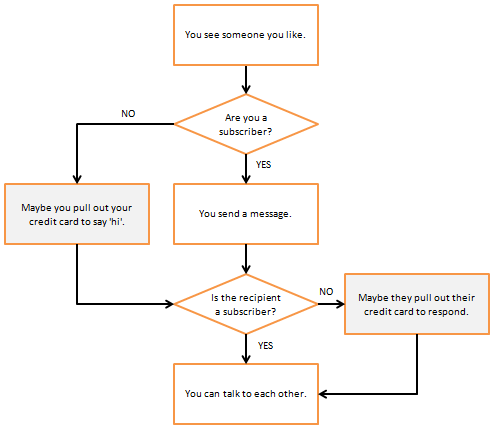 And finally this flow diagram kills it dead. The owners of Match.com must have been having kittens by the point. Remember, sites like Match and eHarmony are in business to get you to buy a monthly subscription. There’s nothing wrong with profit motive, but the particular way these sites have chosen to make money creates strange incentives for them. Let’s look at how the pay sites acquire new subscribers. That for me is a clear sign that we’re about to be shafted. Yagan might be right that he was not told to remove the blogs but to be honest the fact he felt that he had to take it down speaks volumes! And its going to be a very bumpy ride down to the bottom, I can feel it now. And I want to get off now. I want out! And I’m not the only one. I’ll be interested to see what kind of protest the people of okcupid put up. Might be worth starting off a specially branded avatar… Bit like whats been done on flickr before. Previous Previous post: Google bought youtube and they laughed….